Our school wide goal for the 2017/2018 school year is for our students to complete a total of 3,000 acts of kindness throughout the year (about 1,000 acts per trimester). Each class will be trying to achieve their classroom goals and moving their “marker” along the bulletin board to show everyone how they are making progress toward their goal and also competing against other classrooms. 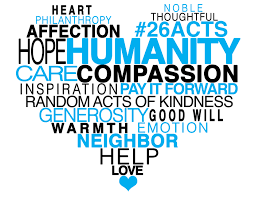 Students will complete an “Acts of Kindness” form which will include space for students to write a short description (or draw a picture) of what they did for someone else and return it to their classroom teacher so the act of kindness can be counted toward our school goal. We will be celebrating our progress toward meeting our goal during each monthly Leadership Assembly and we’ll look forward to celebrating meeting our goal at the end of this school year. Thank You for the support of your students as they work toward meeting this goal to make a positive impact and complete acts of kindness with family members, friends and people within our community.